Here’s the third “class” in our ongoing Barbecue University™ blog series—a crash course on wood. Wood is the original and, to my mind, still the best fuel for grilling, and grill masters from Montevideo to Munich back me up on this. 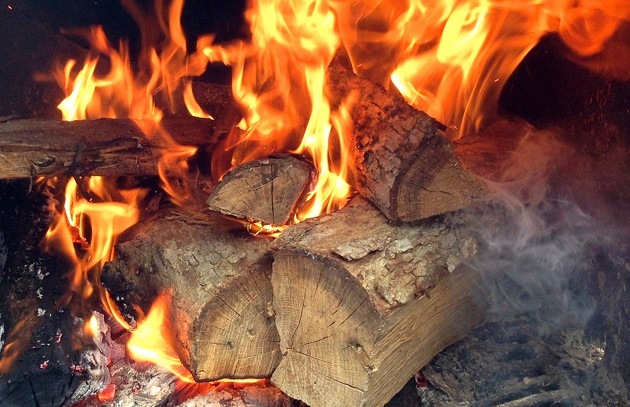 Charcoal and propane or natural gas produce heat, but only wood gives you both heat and flavor. That flavor is, of course, smoke—made up of carbon compounds like guaiacol, also found in roasted coffee, and syringol, the active ingredient in liquid smoke responsible for the “smoky” flavor. 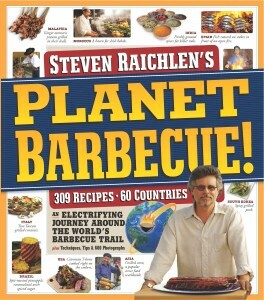 Wood has two very different uses on Planet Barbecue. As a fuel it imparts delicate flavor of wood smoke. As a smoking agent—whether charcoal, gas, or an electric burner provides the heat—it imparts the heavy smoke flavor associated with traditional North American barbecue. The most common woods used for grilling are oak, used in California, South America, and Europe; beech, used in Germany; grapevine roots and trimmings, used in France and Spain; and mesquite, used in Mexico, Texas—and in Hawaii, where it goes by the name of kiave. Conventional wisdom holds that you shouldn’t use softwoods, like pine and spruce, for grilling, the theory being that their smoke is high in tars and creosote. However, in France, mussels are grilled on pine needles, and in Germany, people grill bratwurst over pinecones—all with fabulous results. Use whole logs for open pit and campfire grilling, as well as in front-loading and South American–style grills. 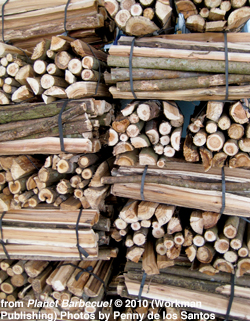 Use split logs and branches in kettle grills and table grills set up for the direct method. Use wood chunks lit in a chimney starter just as you would when grilling with charcoal. 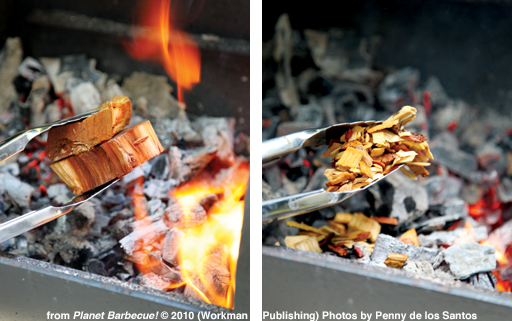 You can also toss wood chips or chunks on a bed of charcoal embers for a smoke flavor. Toss wood chips on the coals for a mild smoke flavor, or soak them in water, then drain and use them in smokers and kettle grills to produce the heavy smoke flavor associated with traditional American barbecue. You can also get smoke flavor by using pellets or disks made from compressed hardwood sawdust. Pellet “grills” (or more accurately, pellet smokers) like the Traeger, have entered the American barbecue mainstream. The Bradley smoker, popular in Canada, burns hardwood sawdust disks. These fuels give you great flavor, which you can vary by using different hardwoods—just be sure to keep them dry or they lose their combustibility and flavor. And, pellet smokers have turn-of-the-dial heat control, thanks to a built-in electric thermostat, and timers to control the cooking time. However, this fuel is used for smoking, not grilling—and for some purists, the notion of an electronically controlled smoker is just too easy. Want to know more about the nuts and bolts of grilling? Click here.